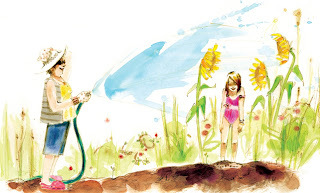 A Note From the Publisher: Grandma is always on her knees in the dirt, with her gardening gloves on, talking to her roses. 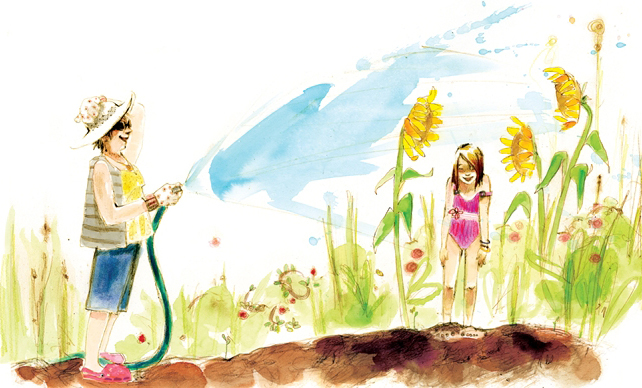 Her home brims with plants and blossoms, and on hot days, she even waters the little girl in this story, her "most special flower of all," with the hose. But a day comes when Grandma isn't there to care for the little girl anymore. She feels sad and small and alone until she remembers all that her grandmother taught her- and all that she has to teach. Full of light and life and the solace of green, growing things, this moving and beautifully illustrated picture book explores a timeless bond with warmth and joy. Why It's On My Bookshelf: I couldn't help but to tear up while reading this. It is such BEAUTIFUL bibliotherapy. When I was a child, I would have wanted to read this to help with grief. It's the type of life lesson that puts a smile on your face when you close the book. There is so much we can teach children about what they can do with the memories they have of a grandparent. Author Cecil Castellucci reminds us to take these gifts and wisdom and keep passing them on. In Grandma's Gloves the little girl appreciates her Grandma's adoration of gardening. Her memories are filled with Grandma working in her garden and always having her gloves nearby. A relationship and bond formed out of this hobby. It's the connection to her Grandma. Who knew a pair of garden gloves could mean so much to a little girl. They mean so much that she wants to keep the tradition alive...so lovely. It got me thinking about a set of bowls I have in my kitchen. When my own Grandmother passed away they were given to me. I love them because of the meaning behind them. They remind me of the memories of the wonderful meals she would make us on Sundays. Although it's sad she's not around to make us her yummy German recipes, I take comfort in having the bowls in my home. And when I use them - it's very special to me....just like the gloves in the book. I love these kind of stories about grandparents. Theirs is the kind of love worth remembering. To those who still have their grandparents, seize, treasure and enjoy each time with them. Blessed are the children and the grandparents.